The closing event of the Istanbul Arts & Culture Festival’s 2016 instalment took place in Soho House’s luxurious Big Room. 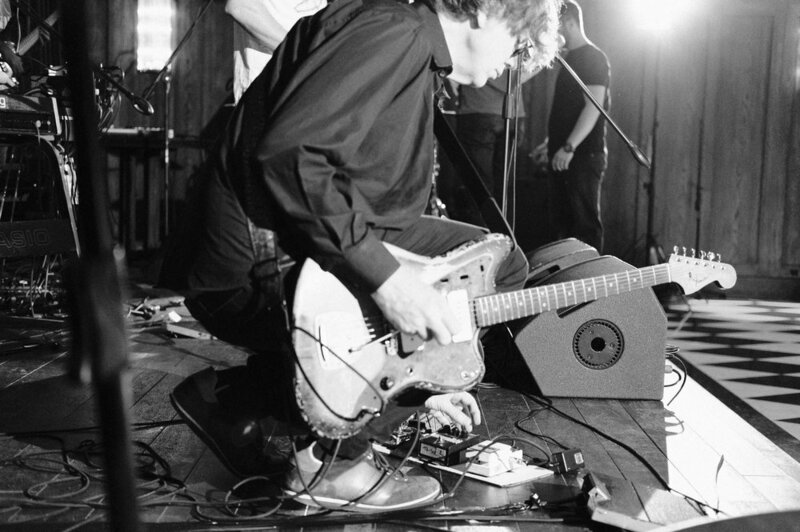 Konstrukt hosted Thurston Moore for the first time in their 8 year long existence sharing the stage with the likes of Peter Brötzmann, Joe McPhee, William Parker, Akira Sakata, Marshall Allen, Evan Parker, Eugene Chadbourne. I went early to the venue to hang out with the band and take some pictures during their soundcheck and the concert. To be honest, although I am well aware of the separate musical abilities of the current members of Konstrukt, I never heard them play together their own brand of multi-layered, ultrasound, hyper active improvisation before. 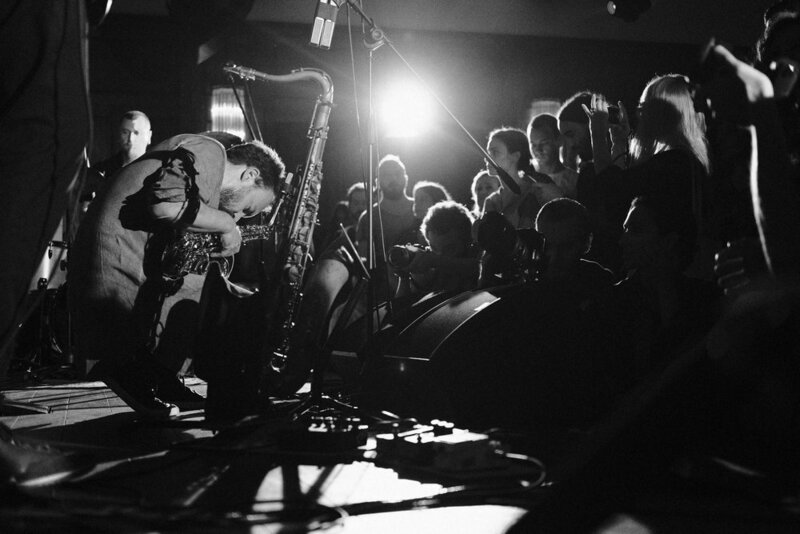 Korhan Futacı has involved his vocals and sax playing with many cult bands from the Turkish underground i.e. Dandadadan, Tamburada, and recently Kara Orkestra in addition to being one of the well respected sax players of his generation in the Jazz Scene locally and abroad. Barlas Tan Özemek is a young talented guitar player, composer, and producer with previous Yasemin Mori Deli Bando and current Kara Orkestracredits under his belt. Barlas also released a single where he sings his own lyrics. Ediz Hafızoğlu, born in Bulgaria, is the strong drummer of the band and he is known to smear the last bit of ear grease off the audiences (if there is any after being exposed to the barrage of sound this quartet releases on you). He is definitely the stronghold of this quartet and any other musical situation he takes place in. Umut Çağlar is best known as an improvising guitar player, also plays keyboards, woodwinds, percussion. His previous solo & collab work has been released on local and international labels. Tonight possibly due Thurston’s appearance he forgoes his guitar, and is helming a table of synths and electronics, and also the zurna and gralla. I had almost an hour to witness the musicians do a soundcheck and prepare the hall for the concert. I took this opportunity to take some photos. Although the room is not specifically designed to host sound events, it sounded great to these ears during soundcheck and the concert itself. The subtle and warm lighting of the place was less animated than the band’s musical score, and a compliment from the organizers of the festival to let the music and sound shine through. The hall was an hour late to be vacated from the previous seminar of the festival programme. Thus, the soundcheck started an hour later than programmed. As a filmmaker, I am always intrigued towards musicians’ alone moments before the audience gets in, before the room takes its final shape filled with other people. Musicians do not play to empty rooms, but people. The architectural minutiae of any empty room totally changes into something else when the audience comes in, living, breathing, chatting, desperate, and happy. The contract between musician and listener gets finalised here, not in an album, not on your iPhone, but here in a concert. It’s 19:00 and it’s showtime. The crowd gets in the hall, and the lights of the stage are off. The silence of the room gets filled with the murmur and abrupt applause and screams from the crowd. After all, Thurston Moore is probably a hero and a role model to many in the crowd as Roger Waters was to the previous generation. I retreat to the side of the stage since I had enough time to scout the hall for the best location to shoot some photos. 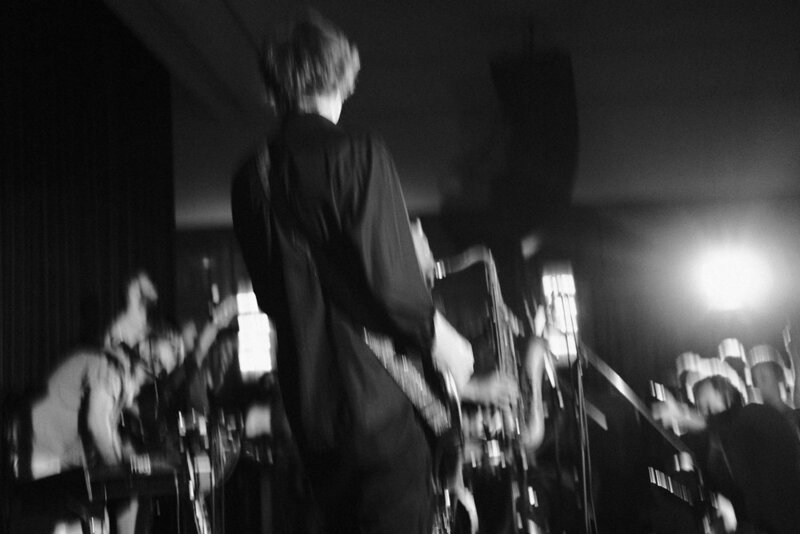 I liked the way I can get up close to the band from the sides, and that I could skip sides easily using the backstage. I happen to listen to a lot of improv, electro-acoustics, electronics etc. I am acquainted with most of the Erstwhile catalogue, a diehard fan of Radu Malfatti, Axel Dörner, Kevin Drumm, Bernhard Guenter, Jason Lescalleet, Supersilent and other conspirators. To be honest, Improv is dead music. It is not marketable, It is not a commodity to be purchased, or shared on the hyperlink killing social media. Your friends, your parents won’t like it, you can’t sing the choruses to them, you can’t blast it on the stereo of your car. It’s dead because it can’t be second-handedly communicated to others. The thing that makes it precious is to witness it the moment it is born and carry it to your grave. It is dead because it dies the moment it is sung or played. Well, tonight was alive. The music played tonight encompassed everything I love about the free music. There was a lot of listening among musicians. Although Thurston most of the time was an instigator of the musical ideas, and cues, Korhan’s sudden blasts, and quitely evolving pianissimos, Umut’s textures, Ediz’s rhythmic and sometimes melodic parts, and Barlas’s deep currents did shape the music of the night. I was ready with my ear plugs (made out of paper towels) to take the barrage of sound coming my way. I am well aware that being as close to the stage on the sides, or even on the stage is the best place you can be for sound quality. Musicians take most of the time in soundcheck to tune their stage p.a. and the mix to their own taste. Being on or close to the stage, their efforts are well worth it for an audience member like me. It was a surprise to see that Thurston and Konstrukt were so in tune to each other although it was the first night ever they played together. Dissonant and radical at times, the sound almost always relegated to a comfortable and coherent mood after those moments. The show was at times shifting and revisiting of temporary distortions of musical ideas, and spare moments of thumping and grooving manoeuvres. I felt like coherency was in place, and Konstrukt is well ready to break apart the mood and bring it back together on demand. The music, the mood, the atmosphere provided me a maelstrom of photo ops. The sound and the atmosphere blurred in my head, and I was moving on the sides to take in a maximum amount of moments in hopes of publishing them sometime, somehow. For the first time during the night, I move in behind the audience to take some shots of the stage. It turns out the show has come to an end. Thurston with his fist up calls for his hosts of the night and they all salute the audience and it lookes like everyone was content with the way night turned out. The band moves backstage, and the friendly atmosphere there puts a formidable end to this night full of good music played by nice people. 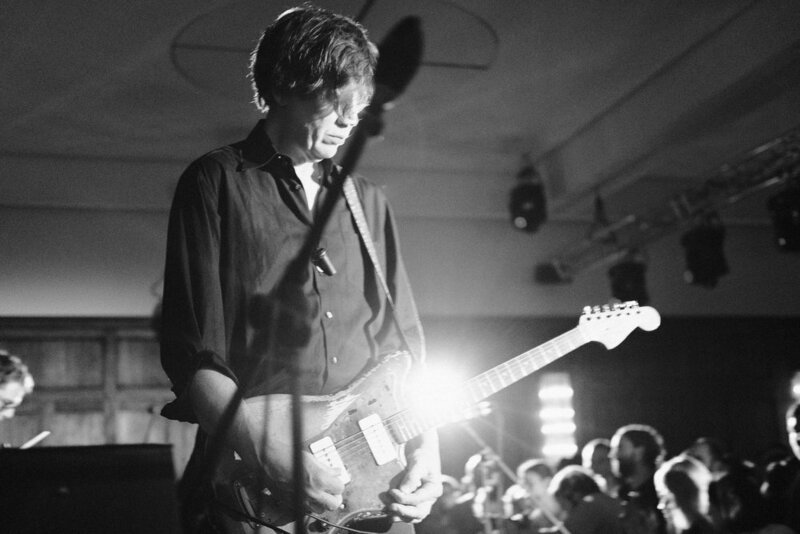 Seeing Thurston Moore play a night of improvisation along with talented members of Konstrukt was a rewarding experience and reminded me again how powerful and beautiful music can be when in good hands. I should like to thank Korhan, Barlas, Umut, and Ediz for letting me sneak around with my camera. Also, Thanks to Alphan Eşeli and Demet Müftüoğlu of Istanbul ’74 for organising this rare jewel of an event.